When searching for a web host for your new website, you will always wonder how reliable they are. The worst thing to deal with is having a server go down and have to contact their support team. Luckily, HostGator gives you a lot of peace of mind. They are known for being one of the most reliable and easy to working with companies in the industry. Their service has been awarded by HostAdvice, PCMag.com, and Already Host. HostGator has plans to fit any type of website and any budget. Starting with their shared hosting and working your way up to WordPress, VPS, and dedicated hosting. Whichever plan you decided is the perfect fit for your website, they will be with you every step of the way. As WordPress is becoming a popular choice for content management systems. HostGator is ahead of the game by offering servers that are optimized for this system. You can experience up to 2.5x faster loading times with HostGator. This is from their supercharged cloud architecture that has multiple caching CDN network. By using their Cloud Hosting service for your WordPress site. You get advanced security to monitor all additional resources. You have total control over your usage, at no extra charge. When your website outgrows the started shared hosting plans. You can easily migrate to HostGator's VPS or Dedicated servers. This gives you more resources and loading power for increased website performance. Their VPS servers start with full 2 CPU processing and 2GB of RAM. With enough disk space and bandwidth to fulfill all your visitor requests. With a VPS server, you get root access to customize and optimize your hosting experience. If you need a full server to handle your increase of traffic, you can look into a dedicated server. This gives you a full server only used by your website. Starting at a full 2 core CPU and 4GB of RAM with full root access. Hosting companies are always trying to increase their load time for their customers. HostGator is no exception. They have an advantage of 3.00 seconds of total load time. HostGator came in .09 seconds faster than BlueHost with a .03% better uptime rating. HostGator came in .30 seconds faster than GoDaddy with a .01% better uptime rating. Overall HostGator is close to their rivals BlueHost and GoDaddy. But edging them out overall in page load time and uptime. HostGator has a reputation of being a great hosting company with grade A support. You can see what others think that use their service for their websites. PCMag.com picked them as their top web host pick. HostGator has quality dedicated and virtual private server (VPS) server packages, but its shared plans are one of the reasons why the company stands out from the very crowded Web hosting pack. In fact, HostGator's shared packages are so robust that PCMag named the Web host our top pick in that subcategory. They offer all types of hosting plans, that it doesn't matter if you need shared, VPS, or dedicated. They have any type of hosting that your website needs to be successful. Henry Green with wpbeginner.com recently signed up for HostGator with his WordPress site. I have been a HostGator customer for several months now, and the experience has been completely positive. Early on, I changed my name servers and then messed up my WordPress install. I went to the HostGator website and was quickly connected with a super friendly, super helpful support agent. Five or so minutes later, he had fixed my WordPress install and my site was working great! Definitely recommend HostGator. Even when he messed up, HostGator's support team was there to help you fix the problem. Kevin Wiebe from mypoeticpen.com gives an easy run down why he loves HostGator. 2: It works 99.9% of the time. 4: Did I mention it is cheap reliable and easy to use? Maybe the bad complaints are specific to some of their servers but my sites are working without flaws and I'm happy. His list makes up what other people have found to be a plus side to HostGator. Reliable and easy to work with. Their pricing is going to reflex what type of server you need. For a basic site, you will need a shared hosting plan. For those looking for more performance, look into their Cloud and VPS hosting. If your site is doing over 10,000 visitors a day, you may consider a dedicated server. Shared Hosting starts at $2.78 / month. Cloud Hosting starts at $3.58 / month. WordPress Hosting starts at $3.98 / month. Reseller Hosting starts at $19.95 / month. VPS Hosting starts at $19.95 / month. Dedicated servers start at $79 / month. Always check HostGator's homepage for current deals, offers, or coupons. They like to always offer something for new customers. HostGator has a lot to offer. From their vast array of hosting options to their reliability, speed, and customers service. 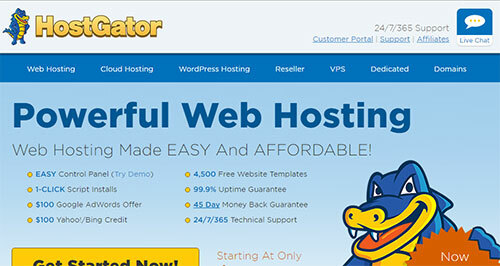 If you are in the market for a solid hosting company for your website, you should consider HostGator.